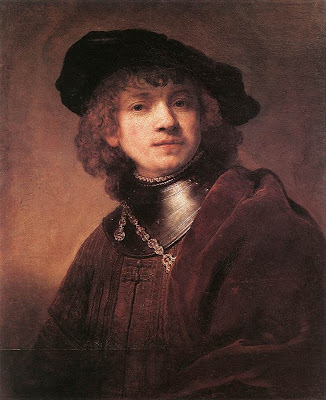 Google's search engine start page today reminds me that this is the 407th anniversary of the birth of perhaps the most celebrated painter in the western canon, Rembrandt van Rijn. Above is a self portrait done when he was about 28. Note the brilliant (in both senses) use of illumination on his face and collar, the almost palpable fleshiness of his face and texture of his garment, and the intensity of his half-shaded eyes. Although Rembrandt is best known for his portraiture, his landscapes are also sublime. 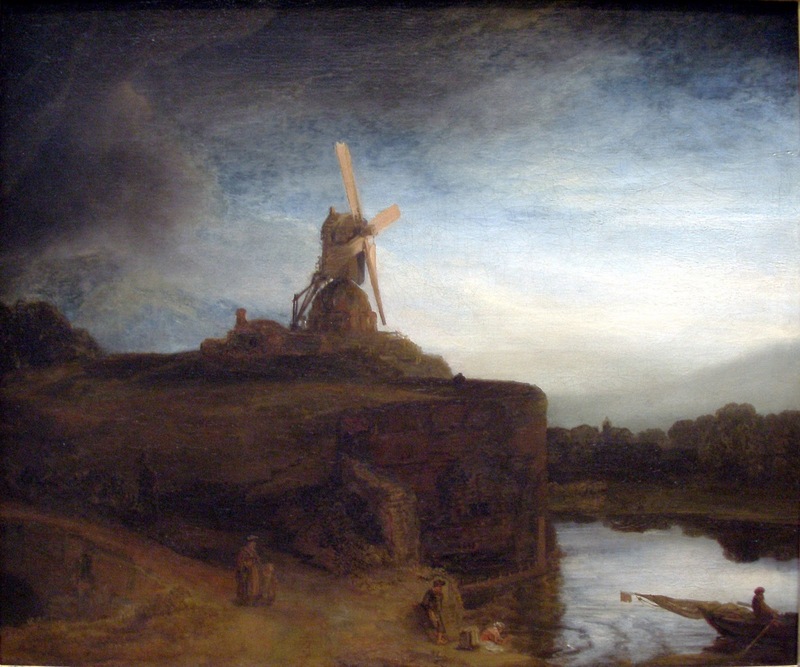 The Mill (1645-48) again demonstrates his skillful use of light, as well as the delicacy and precision of his brushwork, as seen in the cirrus clouds at the top of the painting, the texture of the cliff face, and the woods on the far shore. Addendum: Michael Sorgatz tells me they've just rehung the Rembrandt gallery at the Metropolitan Museum of Art, and that it's "fantastic." Images: Self-Portrait, Wikipaintings; The Mill, Wikipedia. This is post number 1066, so it must be the Battle of Hastings. Blogger tells me this is my 1,066th post on this blog, so what could be more appropriate, I thought, than to feature a live video of the last successful hostile military invasion of Old Blighty, which happened in the year 1066 and culminated in the Battle of Hastings. The authentic re-enactment shown in the video above was done by Twice a Fortnight, a group formed in 1967 that included future Monty Python cast members Terry Jones and Michael Palin, along with Tony Buffery, Graeme Garden, Jonathan Lynn, and Bill Oddie.